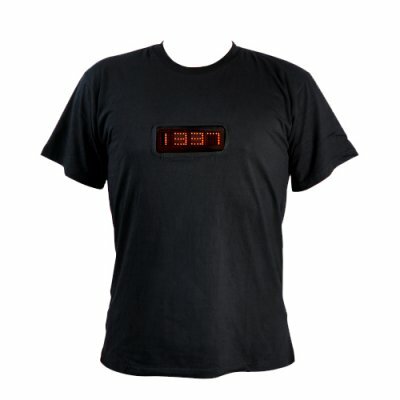 Successfully Added LED Shirt with Time and Programmable Message Display (Extra Large) to your Shopping Cart. After telegrams, voice calls, SMS, emails, we are glad to introduce the newest and coolest way of communication for generations to come: customizable LED messages sliding on your chest! With this unique LED Shirt, you can display and edit 6 different sentences, logos, mottos or just names of up to 255 characters each! The brightness is adjustable, and the speed and way of displaying words can be chosen among a extra large choice of pre-registered modes. Finally, a way to let your inner geek out!